Discovering the shared brand values between a cross-cultural consumer and the global brand that wants to connect with that consumer is an exciting process. There are always unexpected cultural truths that come to the surface from both sides. What we do to leverage those shared values is one of the most fascinating parts of developing strategy for cross-cultural brand messaging. One of the ways we uncover shared values between the brand and consumer is through an intensive cultural exchange with the brand. When Potter Ruiz worked alongside Arnold Worldwide (the Global AOR) to develop the Jack Daniel’s campaign for the Hispanic market, we began the brand journey with a week-long visit to the famous “Camp Jack” at the Lynchburg distillery. This immersion allowed us to make a personal connection with Jack Daniel, Lem Motlow and the people who make Jack Daniel’s a great brand. Understanding the brand beyond what’s on the surface allowed us to get to the essence of “who” the company is. Jack Daniel dedicated his life to make the best Tennessee Whiskey, and he was so proud of it that he gave it his name. We discovered a natural alignment to Latino pride of heritage and desire for advancement through hard work. At Potter Ruiz, we see every brand as a living entity — creating, communicating, and evolving just like a human. This perspective helps us make a connection between the living brand and the living consumer. The connection between the brand and consumer is essentially a conversation driven by shared values. Determining what this “conversation” is at the core of what we do at Potter Ruiz. 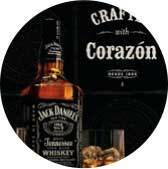 Through the brand immersion, we discovered Jack Daniel’s affinity for socializing and celebrating. This aligned well with Hispanic’s love of celebrations. We also discovered the shared value of music while learning the history of Jack Daniel’s lifelong support of live music. Like Jack Daniel, Hispanics are passionate about many genres of music. We found a way to connect the Jack Daniel’s brand with the Latino spirit and built multiple campaigns around that connection. We highlighted the bond between friends, the unspoken expectations inherent to social events, and the Latino camaraderie of tailgating and sports-related get-togethers, as well as their near-spiritual reverence for music. With each execution we grew the brand relationship and further built trust and affinity for Jack Daniel’s within the Hispanic market in a way that felt natural, relevant, and real. Ultimately, through this value-sharing process, we opened the lines of communication between brand and cross-cultural consumer in a way that felt organic and unforced, creating a foundation for future connections and conversations.